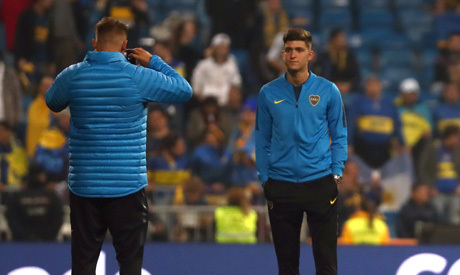 Bundesliga leaders Borussia Dortmund on Monday completed the transfer of Argentine teenager Leonardo Balerdi from Boca Juniors, with the Under-20 international signing a reported five-year contract. The talented 19-year-old central defender was expected to join next season but the deal was brought forward, Dortmund sporting director Michael Zorc said. German media reported the deal to be until 2024 and worth 16 million euros ($18.3 million). Zorc did not give any details but said that Balerdi had signed "a very long contract." "The transfer of Leonardo Balerdi is one with potential which was initially planned for the summer," Zorc said in a statement. "Leonardo is an intelligent, strong and powerful central defender who is also powerful in the air. We are happy that he opted for us and that his talent will help us in the future." Dortmund have been a popular destination for talented teenagers to hone their skills in recent seasons. Ousmane Dembele, who now plays for Barcelona, Christian Pulisic, who was snapped up by Chelsea recently and remains at Dortmund on loan, and Jadon Sancho have all made a name for themselves as teenagers while playing for the Ruhr valley club. Usually a central defender, he was with the Argentina Under-20 team, preparing for the South American championship that begins in Chile on Jan. 17 before travelling to Dortmund. It was unclear if he would rejoin the national team. The Bundesliga resumes this week after a winter break, with Dortmund top of the table, six points ahead of champions Bayern Munich.